On Saturday, January 20, 2018 Prince George's County Fire Chief Benjamin M. Barksdale notified the Department of several promotions. Please join me in congratulating (7) Fire/EMS Department employees for their upcoming promotions, effective Sunday, January 21, 2018. I look forward to speaking with each of them individually in the upcoming days. Their promotions are a direct reflection of their hard work and dedication to this Department, as well as to the residents and visitors for which they serve. There is no greater award or recognition a firefighter or medic can receive then to meet a patient they believed they would never see again. On Saturday, January 20, 2018 five Prince George's County Firefighter/Medics did just that. An added bonus was to also meet the 4-month old baby that had not yet been born when they treated and transported the soon-to-be mom. In early September 2017 an adult pregnant female was intentionally set on fire by her boyfriend while at her apartment in the Fairmount Heights area. 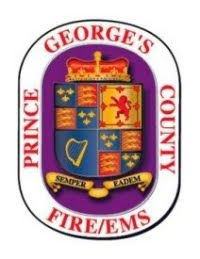 Prince Georges County Firefighters and Medics responded and initiated treatment on the patient that had sustained burns over 70% of her body. The initial EMS crew, Ronel Fayette and Melvin Batts, made patient contact and did what they could but knew advanced life support and a quick transport to a Burn Unit would be needed if the patient was going to survive. Just moments later, Paramedic Ambulance 838 from the Chapel Oaks Station, Andrew Koch and Danielle Lewis, arrived and initiated ALS patient care and made preparations for transport. Paramedic Supervisor, Dale Giampetroni, arrived and assisted medics. All the care providers realized that rapid transportation to a nearby Burn Unit was in order. The patient was transported in critical condition and delivered to the Burn Unit in neighboring Washington, D.C. Firefighters and Medics performed the very best pre-hospital care and transport they could and continued to follow the incident through media reports. The patient, Andrea Grinage and infant Journey (names used with patients permission), recently contacted the Fire/EMS Department and requested to meet the crews that treated and transported her. This past Saturday that request became reality when Andrea and family visited the St. Josephs Fire/EMS Station in Springdale. Andrea, along with infant Journey, met the crew and personally thanked them for everything they did to help save her life and that of her baby. The Fire/EMS Department also recognized the crew with Certificates of Award and a "Life Saved" challenge coin. The presentation was made by Assistant Fire Chief Tony Hughes along with Andrea. Andrea also presented the crew with Stop Domestic Abuse buttons. The following video and images by Mark E. Brady and are OK to use. To watch the emotional reunion click here.